The Cowboys need to find a way to slow down Patriots tight end Rob Gronkowski (left), and the return of defensive end Greg Hardy (right) will certainly help them do just that. The Week 5 game between the New England Patriots and Dallas Cowboys is not quite the matchup we expected when we first saw the schedule. For one, Tom Brady was supposed to be serving the final game of his four-game suspension. The Cowboys were supposed to have both Tony Romo and Dez Bryant leading the offensive charge, but both players suffered early season injuries, and neither will play in this game. The Patriots are playing at near full strength, having not suffered any major injuries yet. Tom Brady looks as locked in as ever behind an offensive line that is doing an excellent job in pass protection. However, the Patriots no longer have several key pieces from the defense that won the Super Bowl, and opposing offenses can attack them via the passing game. The Cowboys are still looking to establish some consistency on offense with Brandon Weeden at the helm. Weeden’s play hasn’t been the reason for the Cowboys’ two-game losing streak, but the offense has certainly been limited. Here are three keys to the game for both the Patriots and Cowboys. Can you beat the Crowd’s Line? Submit your final score prediction below. Good luck! One of the best ways to negate a strong pass rush on offense is to get the ball out of the quarterback’s hand quickly. Few quarterbacks are better at doing just that than Tom Brady. Julian Edelman and Rob Gronkowski have done a great job of running short routes and getting open for Brady, while they’re also great after the catch. The Patriots would be smart to throw quick passes to slow down the Cowboys’ pass rush headlined by Greg Hardy and DeMarcus Lawrence. The Cowboys are obviously depleted on offense short Tony Romo, Dez Bryant and Lance Dunbar. That doesn’t leave Brandon Weeden with many targets in the passing game. Witten is one of those targets, and he’s the most reliable. The Patriots need to take Witten away by sending double coverage his way with a safety and linebacker underneath. Lewis has proved to be one of the toughest backs to cover in the open field, especially when used as a receiver out of the backfield. The Patriots should take advantage of Lewis by matching him up on linebackers when possible, similar to the way the Saints did with C.J. Spiller on the game-winning touchdown. Lewis is both fast and shifty and can consistently beat linebackers in coverage. It’s not easy to slow down Tom Brady and the Patriots’ passing game, but the one way to stop them is to disrupt the timing. This is an offense that works in sync, and the Cowboys will need to get physical against the wide receivers and tight ends. This means heavy usage of press-man coverage and zero coverage concepts over the top. The key is to make Brady beat you with the deep ball. We caught a glimpse of what Brandon Weeden can accomplish with the deep ball when he dialed up and connected on a go route to wide receiver Brice Butler in Week 4. In Week 5, Weeden needs to aggresively attack the Patriots’ outside cornerbacks — a position group that has taken a major step back without Darrelle Revis in 2015. This could be the game plan for every defense in 2015, seeing as no safety or linebacker can cover Gronkowski one-on-one, but the Cowboys need to make Brady throw away from Gronkowski and outside the numbers. If they can limit the Patriots’ production in the middle of the field, don’t be surprsied if the Cowboys can be the first team in 2015 to slow down the Patriots’ passing attack. 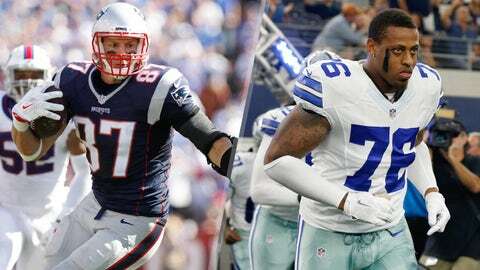 The Cowboys have the potential to generate pressure on Brady with the return of premier defensive end Greg Hardy.